This is our custom-built Adapter or Specialty cable. Construction is Neutrik connectors with Mogami 2552 cable. Neutrik connectors are some of the best connectors around. Mogami 2552 is a balanced "microphone cable" style cable and is very flexible, durable, light-weight cable. Balanced connectors will be wired "1 to 1" using the most commonly accepted pin configurations, e.g., XLR to TRS would be 2 - Tip, 3 - Ring, 1 - Sleeve. For unbalanced connectors low and ground will be tied. If you have any special requirements, please let us know. Photo 1 shows 6' cable with XLR female and TRS 1/4" and red shrink label. Photo 2 shows one option for the two ends with XLR female and TRS 1/4" and red shrink label. 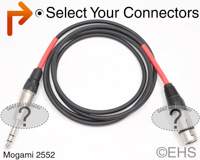 For a comparable unbalanced instrument cable we recommend the 2319 cable CLICK HERE.